If you’ve looked into Hoyes, Michalos & Associates Inc., you’ll know that we strictly help individual people, not corporations or big banks. While we both started our careers doing corporate work at big accounting firms, my partner Ted Michalos and I made the decision years ago to focus on helping individual people deal with debt. Since starting our business nearly 20 years ago, we’ve learned a lot about the average debtor and why they get into debt. We even started an biennial report about it with our Joe Debtor bankruptcy study. Our study is beneficial for outlining types of debt people carry, causes of debt, and employment information. My new book Straight Talk on Your Money was written to focus on the broader picture. After helping people with insolvencies all of these years, there are recurring themes of why people get into debt. It starts off innocently enough, borrowing for your wedding, loaning money to your adult children, or stretching yourself just a bit too far on how large of a mortgage you can afford. The trouble is, there isn’t a guide out there. Sure you know to try and set some money aside, but do you know how to automate that process? Everyone has a savings account, but do you know if there are penalties involved in taking out your money? The best way to avoid overwhelming debt is to arm yourself with the financial knowledge you need to make sound financial decisions. What is Straight Talk On Your Money? This book is a compilation of the typical money mistakes we see as Licensed Insolvency Trustees. 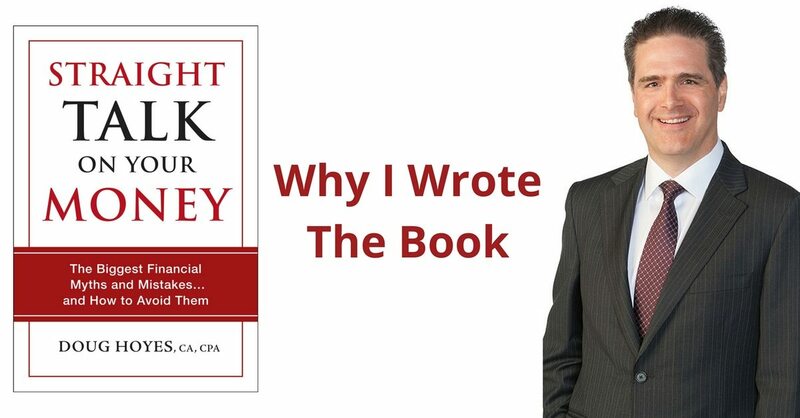 Throughout the book I debunk the top 22 money myths that we regularly see from our clients. I also discuss practical options on how you can avoid them. Of course I also took this opportunity to include a tirade on payday loans, because hey, it’s a problem for a lot of our clients. It’s a short tirade though, I promise. The book is called Straight Talk on Your Money – The Biggest Financial Myths and Mistakes…and How to Avoid Them. When I first started as a professional accountant, 30 years ago, I, like a lot of people, thought that people got into financial trouble because they spent too much money, or didn’t have enough discipline, or didn’t have a budget. I thought their problems were their fault. I thought that the solution was for people to “pull themselves up by their bootstraps” so they could solve their money problems. In other words, I believed conventional wisdom about why people experienced money problems. But over the years I’ve come to realize that it’s not as simple as that. I’ve also come to realize that I have no idea what bootstraps are, and I have no idea how you can pull yourself up by straps on your boots. Before you file a bankruptcy or a consumer proposal, you are required to be personally assessed by a licensed insolvency trustee, like me. Over the past 20+ years (yes I’m that old) I have personally met with and assessed well over 10,000 people having financial problems. I’m required by law to keep notes of those meetings, and many years ago I started to go back and review my notes to try to figure out how people ended up in debt. I assumed I knew the answer. I assumed my notes would show me that my clients, on average, spent more money than the average person, and therefore couldn’t stick to a budget. But as I reviewed my notes I discovered that I was wrong. Yes, most of my clients realized they spent too much, but it wasn’t because they were spending a lot of money on fancy vacations and frivolous spending. They were getting into debt by spending too much money on the things we all spend money on, like transportation costs, and housing. I discovered that my clients were making other mistakes. They were getting payday loans, even though they knew that the interest rates were so high that for some of them it would be almost impossible to ever pay them off. They were applying for lots of different credit cards and term loans because they wanted to increase their credit score so they could get a better deal on a mortgage. I realize that that’s what the financial experts tell you to do to improve your credit score. Yet, if you think about it, getting more debt makes no sense. Instead of getting a short, cheaper car loan, my clients would get a car loan that had the lowest monthly payment, even though it meant they were signing an eight-year loan, to keep the monthly payments low. But that meant that the loan would last longer than the car. Why did you buy a house that big, so now you have a huge mortgage? Why did you think that a lower monthly payment is more important than the total amount you will pay on the car loan? Understanding money is complicated. The average person gets confused between the words “debtor” and “creditor”. Calculating an amortization schedule is complicated. Should I save money in an RRSP, RESP, or TFSA? All of those initials are confusing. So how do we deal with that confusion? After a few years of asking the “why” question, and keeping track of the responses, I realized that there are two big reasons why we do what we do. The first reason is that we follow the experts. If your real estate agent and mortgage broker tell you that you can afford to buy that house, you trust them. After all, they are the experts. If the car salesperson tells you that the eight-year loan is a better deal for you than the five year term, you trust them. They’re the experts. Have you ever gone to the bank to cash a cheque, or to get some US money for your Florida vacation, and the teller says “hey, good news, you qualify for a $10,000 limit on a new credit card!”? If the bank’s computer says I qualify, I guess I should take the deal. The bank knows best about money. They’re the experts. The problem, of course, is that the experts are biased. The real estate agent and mortgage lender want you to buy a house, the car dealer wants to sell you a car, and the banker wants you to take on more debt. That’s how they make money. They are acting in their own best interests, not yours. I said there were two big reasons we make bad financial decisions. The first is that we blindly follow the experts, without fully realizing that in many cases they are trying to sell us something. You may not think of a bank teller as a salesperson, but they are. So how do salespeople sell to us? They play to our emotions. When you go to the car dealer, who’s the first person you meet? Is it the finance manager, to help you crunch the numbers to see what kind of car you can afford? That would make sense. There’s no point in looking at a $40,000 car if you can only afford $30,000, so that should be the logical starting point if the car dealer wants to sell you the car that you can best afford. Of course that’s not how it works. You start by talking to the salesperson. You find a nice car, and they say “take it for a test drive”. During the test drive they say “imagine what it would be like driving to work in this baby; what would your friends say?”. You start imagining it, and you get an emotional rush. A high. You want that car. The deal is done, and now it’s up to the finance manager to find a way to finance that car. That’s why more and more people are ending up with an eight-year car loan. They need to stretch the payments over a full eight years to get the payments low enough so they can manage the payments. I’m guessing that paying for eight years for a car that may only last you five years is not in your best interests, but you trusted the experts (the car salesperson and the finance manager), and you let your emotions influence your decision. Are we supposed to ignore every expert? Are we supposed to act like robots, and never display any emotion? What we must do is look at the big picture. We must realize that we make a lot of financial decisions by following conventional wisdom. Sometimes conventional wisdom is useful, but sometimes it’s just plain wrong. It doesn’t always apply in your unique situation. Sometimes conventional wisdom doesn’t reveal deep truths; sometimes conventional wisdom is nothing more than modern day myths. Conventional wisdom says that owning a house is the foundation of a good financial plan. Your parents tell you that. So do your friends, but is it true, or is “owning a house is the foundation of a solid financial plan” conventional wisdom that was true many years ago, but in today’s world is nothing more than a myth? I did a detailed review of my notes of my assessments with my clients from the last 20 years, and in Straight Talk on Your Money I’ve summarized the top 22 myths that lead my clients into financial trouble. We all think we are rational, that’s the first myth in the book, but I start the book by explaining that we are often guided by our emotions. Salespeople know that, which is why you start by meeting the salesperson, not the rational finance manager, at the car dealer. Myth #2 is that all of your money problems are entirely your own fault. In chapter two I explain why that’s not true, often because of myth #3, that all experts are experts. They aren’t, and you should not blindly trust anyone’s advice. Section two of the book talks about debt myths, and section three discusses real estate myths (and I predict that myth #13, where I say that you should not think of a house as an investment, will be the myth that will get me into the most trouble). In Section 4 I close the book with seven myths about budgeting and financial planning. Straight Talk on Your Money is not just me ranting and raving about salespeople. I have no problem with salespeople; they have a job to do, and they fulfill a very useful function in society. The book is meant to be practical, not a rant. I want you to have the tools to make better decisions, so you don’t just follow conventional wisdom. That’s why I end every chapter with practical advice. I give you specific actions to take to avoid the problems that I’ve personally witnessed over the last thirty years. The good news is that all of the myths I talk about are easy to recognize, if you know what to look for, and easy to understand. There’s no complicated math in Straight Talk on Your Money, and I won’t ask you to fill out any complicated budget spreadsheets. In fact, in Chapter 17 I explain why budgeting, for most people, is a waste of time, and I give my suggestion for a better and easier way to manage your money. Straight Talk on Your Money – The Biggest Financial Myths and Mistakes … and How to Avoid Them will be in good bookstores across Canada on September 9, and is available now for pre-order on Amazon.ca and Indigo. I’m Doug Hoyes, and that was a special edition of Debt Free in 30. Is Filing a Consumer Proposal or Bankruptcy an Admission of Failure? Debt Consolidation Loans – Are they better than bankruptcy?